If you manage a commercial kitchen, whether it’s in a restaurant or hotel, the holiday season is definitely “go time.” You’ve got to crank your process into high gear to serve all the hungry people who walk through your door well and ensure they’re absolutely satisfied. Many people expect food around the holiday season to be extra special and extra delicious, so your chefs and cooks are working hard to take it up a notch. Plus people make reservations for much larger parties during the holidays, so your receptionists certainly have their work cut out for them. Tables need to be turned over faster than ever, so your bus boys are always working as efficiently as possible as well. How can you lighten the load on your staff this holiday season without sacrificing your guests’ impeccable dining experience? 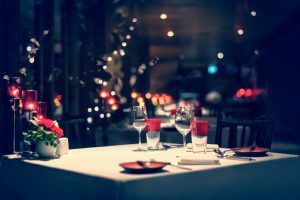 How can you make your hotel kitchen or restaurant move even more smoothly so you can focus on delivering an excellent culinary experience this holiday season? Establish a partnership with Flue Steam to lighten your load this holiday season. We provide a wide range of services for commercial kitchens throughout Southern California. 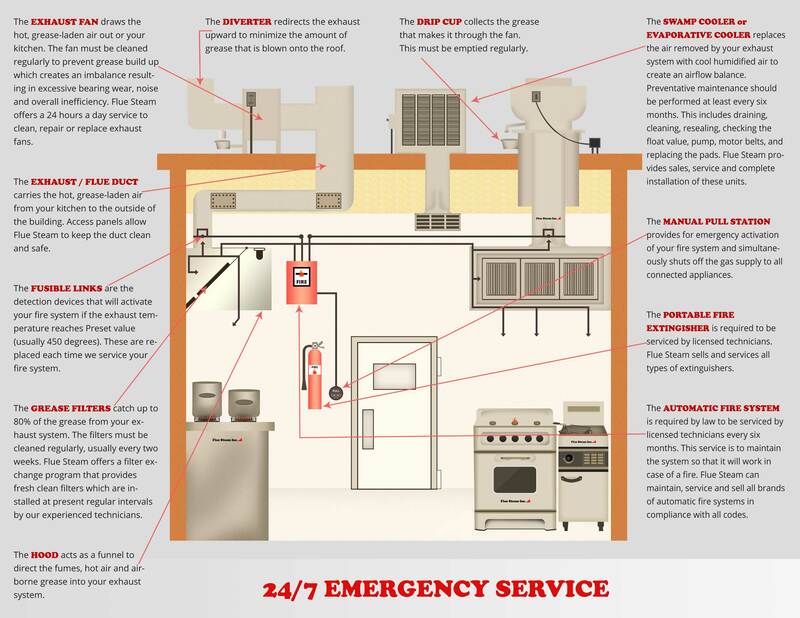 Our mission is to provide complete kitchen air control and fire prevention services to each one of our valued clients. One of our most popular services is kitchen exhaust system cleaning. Ensuring your kitchen exhaust system is regularly cleaned is not only highly recommended for the safety of your commercial kitchen, it’s also required by law. Failing to keep your kitchen exhaust system clean will impede it from doing its job properly. When too much grease builds up in your system, you rush the risk of dangerous flash fires within the exhaust ducts. Prevent that from happening by partnering with Flue Steam today. We’ll schedule hand scraping and steam cleaning appointments at regular intervals so you won’t ever have to worry about keeping your kitchen exhaust system clean again. At the end of every job, we provide “Certificate of Performance” stickers to keep code inspectors satisfied and perhaps even save you money on insurance bills. Every regularly schedule kitchen exhaust system cleaning visit includes an exhaust fan inspection. We’ll check your belts and other parts and grease your fan bearings. If your belts are worn out and you have a replacement readily available, we’ll be happy to install that for you free of charge. This is just one extra way we show we care about making sure your commercial kitchen’s air quality is ideal. When your exhaust fan draws properly, your system will stay cleaner longer. Let’s talk! Call us at 800-700-FLUE to discuss your needs with one of our team members today. We’d be happy to speak with you and help make sure your commercial kitchen’s air is clean and fire-free this holiday season.